These days, San Francisco’s Embarcadero — the waterfront district and boulevard on the peninsula's northeastern end — does more to highlight the city’s maritime past than it does to service its current industries. But the 3-mile-long stretch hasn’t completely shed its roots, or failed to connect with the present. Amid ferry and cruise ship launch points, parks, museums, fine dining and other tourist fare is a 35,000-square-foot lab where Autodesk is testing the future of digital fabrication technology. In many ways, the facility builds on the pier’s former functions — first as a trade center for the global mining industry and, later, as a World War II military logistics hub. Visitors today just need to step inside the timber-framed, stucco-clad Beaux-Arts bulkhead at Pier 9 for evidence that here, past is merely prologue. "This is the place where Autodesk the company kind of eats its own dog food," said J Sassaman, the senior creative workshop manager for Pier 9. "This is the place where we test and prototype and iterate in a parallel way that we expect our users or our clients to use the software." The Pier 9 workshop entrance is within the pier structure. Sassaman has been with Autodesk for nearly four years. She joined when Pier 9 was under construction to help complete the workshop build-out and develop programming. Today, she oversees shop staff and monitors the 1,200 workshop users (all Autodesk employees) and as many as 1,000 visitors each month. The facility opened in 2013. 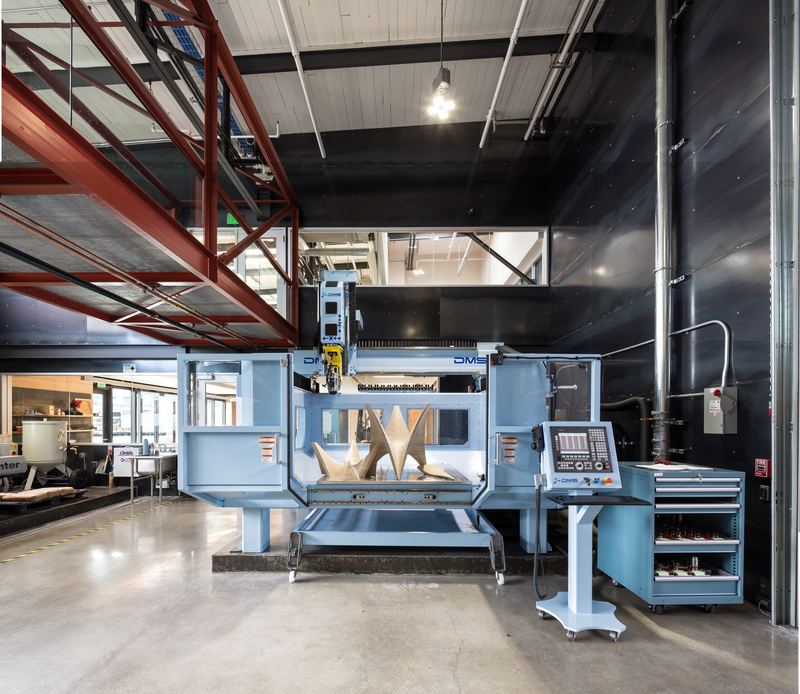 Autodesk worked with San Francisco–based architects Lundberg Design to create a space that brings together heavy fabrication equipment — from a 38-position integrated mill turn center to a paper-based 3-D printer and to a streamlined test kitchen — with collaborative and individual work spaces. The design team had to make the pier’s existing format work for them. "[I]t’s a historic building, and so everything that Autodesk did within the space was a negotiation with the Port Authority," Sassaman said. "The immediate geometry of the workshop was pretty set in terms of it being narrow and linear. We didn't have a whole lot of room to play with there." Work by 2014 Pier 9 resident John Edmark on display. The resulting fit-out pays mind to the pier’s maritime-industrial roots — as does the fact that it shares the remainder of the pier with two architecture firms, the San Francisco Bar Pilots and the Water Emergency Transportation Authority, and, as Construction Dive found while visiting the facility in late March, has killer views across the San Francisco Bay. Materials like steel, reclaimed wood, plywood and cement board abound. 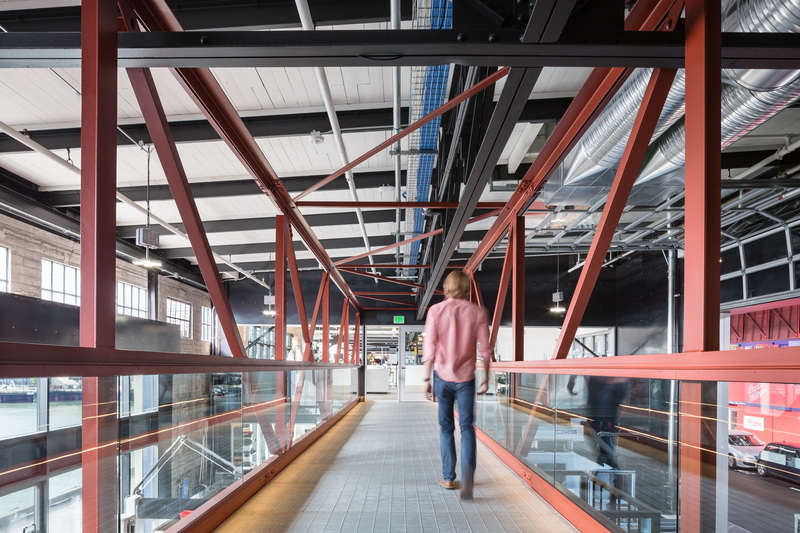 Visitors must walk down the covered pier before officially reaching the lab, which opens into an arcade-style gathering space showcasing the work of previous participants in Autodesk’s Pier 9 Artist in Residence program. The program accepts designers for four-month periods, during which they receive a small stipend and access to the workshop and training. Upon completion, residents publish their work on the Autodesk-owned Instructables.com, sharing what they've learned with other members of the design community. Function and scale divide the fabrication spaces. Entering the workshop from the arcade, the CNC shop is the first stop, with its heavy equipment grabbing attention and visible overhead from a catwalk that bisects the double-height room. "Those are our biggest, heaviest pieces of machinery," Sassaman said. "The bridge above the CNC shop is just an awesome way to see what's going on in those machines, to get that bird's eye view, especially for [equipment] like the waterjet and the [5-axis enclosed router]." Pier 9 resident Paul Ferragut at work in the wood shop. The warm-toned, plywood-walled wood shop comes next, followed by the steely metal fabrication space. Upstairs, real estate is devoted to lighter manufacturing and rapid prototyping, including laser-cutters and a stable of 3-D printers that extrude materials from PLA plastic to paper to resin. A walkway crosses over the CNC shop and connects the light manufacturing space upstairs. Across the catwalk on the second story is workspace devoted to textiles and electronics, along with roughly 200 individual Autodesk staff and resident workspaces, which are divided across the two floors. 3-D printers for rapid prototyping and light manufacturing. Work of design residents past and present is on display throughout the facility. One example is that of Iris Gottlieb, whom Autodesk commissioned to draw as many items in the shop as she could during her time there. The result is a series of illustrated labels identifying where various tools and pieces are stored throughout the workshop. Illustrated labels show where bits, parts, tools and other gear is stored. "Part of the idea behind that project for us was to make the shop friendly and approachable," Sassaman said. "To have an illustration on the front of the drawer means that even if you don't know what the name is of the tool you're looking for, you could probably find it." While the residency program is a key feature of Pier 9, it’s not the full scope of the space. Testing the company’s design and fabrication technology in application is a critical role. Pier 9 is a part of the company’s Digital Manufacturing Group. As such, Autodesk staff regularly uses the workshop to test current and speculative software and hardware products (such as its Ember 3-D printer) to see how the products function in a real-world environment. An object printed on Autodesk's Ember 3-D printer. It's an idea the company plans to scale. 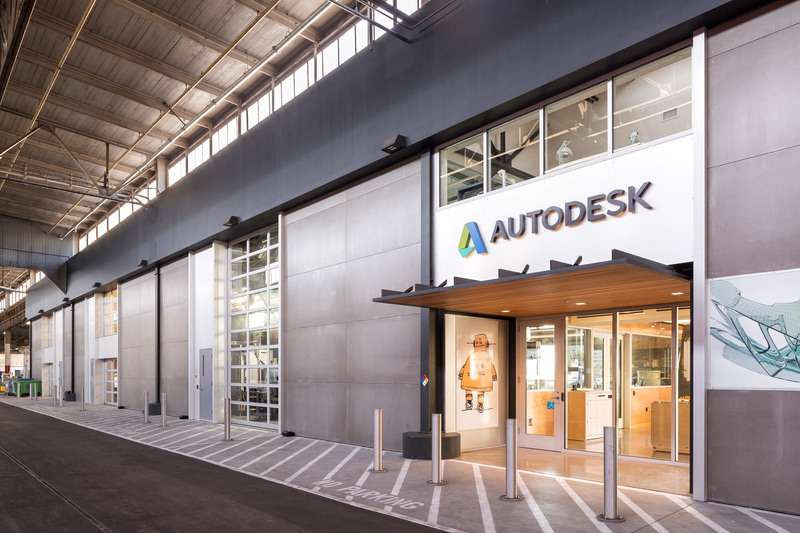 Autodesk recently opened a similar fabrication facility in Boston tailored to the research and development needs of the AEC community. "Pier 9 is one part in what looks like a series of workshops that will be opening within the company focusing on different industries and different objectives," Sassaman said. "Eventually, you would say if you want to know where [AEC technology] is being [explored] in real-life, you would look at the Boston BUILD Space. If you want to know where our manufacturing software is being tested and prototyped, it would be at Pier 9." Why walk when you can zip?